Providence Homes is excited to announce The Lafayette Model Home at Greenleaf Lakes in Nocatee received an incredible HERS Index Rating of 53 with an estimated $117.00 per month electric bill rating for 3,049 square feet of living space. This 100% ENERGY STAR® Certified Home is rated to be 38% more energy efficient than a new 2015 code built home, with an estimated annual savings of over $900! Copies of the HERS Index Rating & ENERGY STAR® Certificate are available at the Lafayette Model Home in Greenleaf Lakes. All ratings are “As-Built” ratings, as opposed to “As-Designed” ratings. “As-Built” ratings are a requirement for a home to receive the ENERGY STAR® Label. This spacious 3,049 square foot, 4 bedrooms, 3.5 bath model home offers plenty of options for the entire family. The 1st floor features a spacious owner suite w/ sitting room, study, formal dining, kitchen/café, and family room and covered patio. 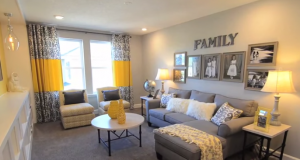 The 2nd floor features 3 bedrooms, 2 full baths and a spacious private loft for the family. The Lafayette also features a 3-car garage. Interior appointments include hardwood flooring and ceramic tile in the main living areas, quartz kitchen countertops, gourmet kitchen package, stainless steel appliances, crown molding, triple sliding glass doors, oversized covered patio and more. The Lafayette Model Home was built with the latest in technology through the use of open cell foam insulation which helps keep the attic within 6-8 degrees of the indoor temperature year-round for added comfort. This means the air conditioning system works less, since all of the ducts are located in a conditioned space, providing you with a cleaner, healthier, more energy efficient home. In recognition to our commitment to building homes with the latest technology, third-party testing and third party certification, Providence Homes has received the ENERGY STAR® for Homes Leadership in Housing and Certified Market Leader award from the Environmental Protection Agency (EPA) in 2010, 2011, 2012, 2013 & 2014. For more information about The Lafayette Model Home at Greenleaf Lakes in Nocatee contact Melissa Matthews at 904-337-5236.